Many people enjoy oysters, a bi-valve mollusk native to salt water, but you may experience side effects that can range from annoying to life-threatening when eating this type of seafood. Understanding those risks can help you avoid reactions. Consider speaking to your health care provider or to a nutritionist to determine whether eating oysters is a good choice for you. It is best to determine where and when the shellfish were harvested -- oysters picked in certain locations and times of year are more prone to make you sick because they can contain potentially dangerous bacteria. The Vibrio vulnificus bacterium lives in naturally warm coastal waters, and the number of these bacteria increases during hot summer months. However, this bacteria is present at all times of the year, so even oysters picked during the colder months can cause illness. Side effects of consuming oysters infected with bacteria include chills and fever, vomiting, diarrhea and skin reactions. You may also go into shock and die if the infection is not treated. People with certain medical conditions are at greater risk from infected oysters. 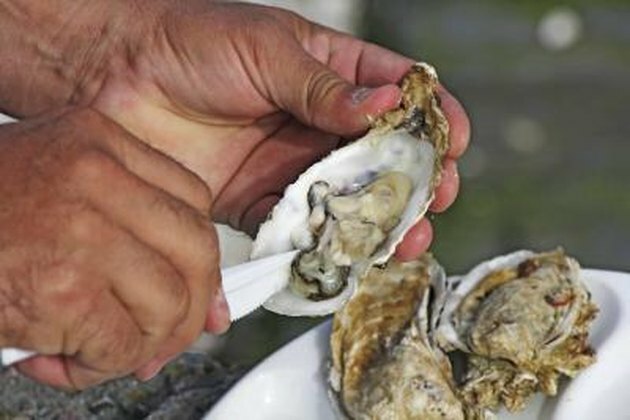 Heat destroys Vibrio vulnificus, so one way to avoid eating this bacterium is to only eat properly cooked oysters. About 3.5 to 4 percent of people worldwide suffer from food allergies, according to researchers at the University of Nebraska; a portion of these people have an allergy to shellfish, including oysters. Evidence presented in the 2008 issue of "Advances in Food and Nutrition Research" indicates that tropomyosin, a protein, is the allergen in oysters that triggers a reaction. Some side effects of eating oysters, both raw and cooked, when you have a sensitivity to tropomyosin include skin rashes and other skin problems, mouth or facial swelling and abdominal pain as well as more serious effects, such as anaphylactic shock that can lead to death. Oysters are quite high in iron – a 3-ounce serving contains 44 percent of the daily value. While getting the iron you need is important for your red blood cell count, people with hemochromatosis, a genetic condition that causes over-absorption of iron in your digestive tract, may need to avoid eating oysters so they don't experience the adverse health effects associated with this condition, including abdominal pain, lethargy, loss of body hair and a change in your skin color. Eating oysters may cause stomach problems, and not just from allergies or bacterial infections. Three ounces of oysters contain 67 milligrams of zinc, or 445 percent of the daily value. Even this quantity of oysters may be enough to trigger gastrointestinal reactions, since it is above the tolerable upper intake level of 40 milligrams per day. These reactions include vomiting, diarrhea and abdominal cramps. The problems caused by the zinc in oysters generally hit within three to ten hours of consumption and fade quickly after your zinc level returns to normal.